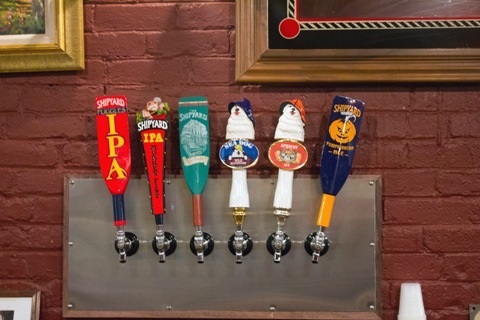 Weekend in Portland, Maine: Brewery Tours and More! This weekend my fabulously awesome husband turned 30. And since you only turn 30 once (or so I’m told… I’m ready to attempt to refute that claim! ), I wanted to do something extra fun with him and ultimately decided on a trip to Portland, Maine. He’s been wanting to hit up Portland for just about as long as I’ve known him, in part because of the wonderful beer scene. I headed up to Portland for Katie’s bachelorette party a couple months ago and absolutely loved it. We didn’t go to any breweries that weekend (but DID go to the amazing Maine Mead Works), so I knew this trip would be a little different. 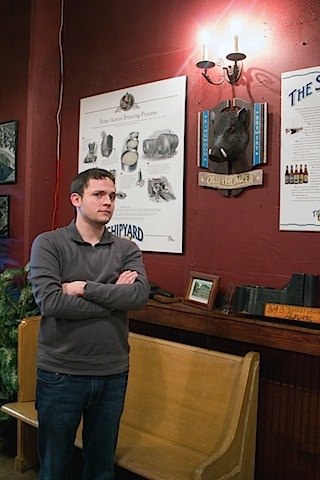 Sadly, many of the Portland-area breweries only conduct tours during the week… which seems crazy to me, but I guess they’re basically saying, “if you’re a big enough fan of our beer to take time off from work, then we’ll gladly show you around!” We’re big fans of lots of breweries, but could only jet off to Maine from Friday to Saturday. But still, I think we were happy with all we got to see! 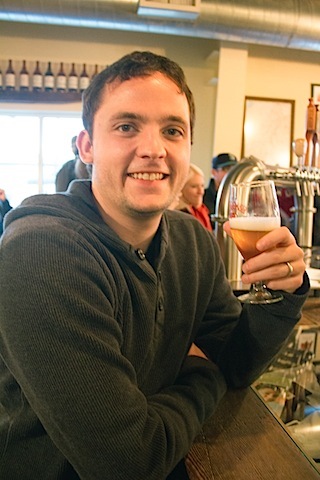 Our first stop of the trip was Allagash Brewery, the spot Chris was most excited to go to. I booked our tour a couple months ago and was super sad when I got an email last week telling me the brewery would be closed on Saturday due to electric work. When Jill told me we could come Friday or Monday, I sadly wrote back that we probably wouldn’t be able to make it in time. And she generously offered to take us on our own private tour whenever we could get there because I told her it was Chris’s birthday. How accommodating is that?? The last tour ended up being later in the day, though, so we made it. We got to partake in the best tasting, with half glassfuls of beer. 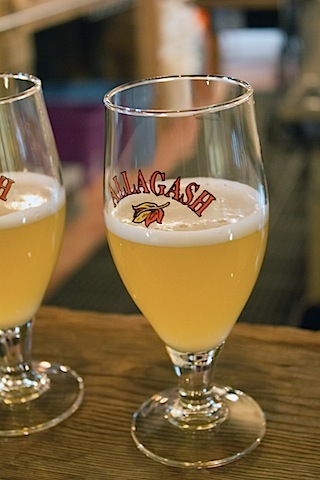 Did you know that Allagash White makes up for 75% of Allagash’s sales? I thought this was crazy at first, but then I realized that I do see it everywhere. I like White, but preferred the Hugh Malone, which was nice and hoppy! Not a bad way to start our weekend! And then take a tour of the brewery while rocking these awesome safety glasses. But seriously; this was definitely the insiders tour and we got to peek in practically every corner. After learning about Allagash’s limited edition Coolship series, I am absolutely dying to try some of those varieties. Give me a good gueuze and I am a happy girl! 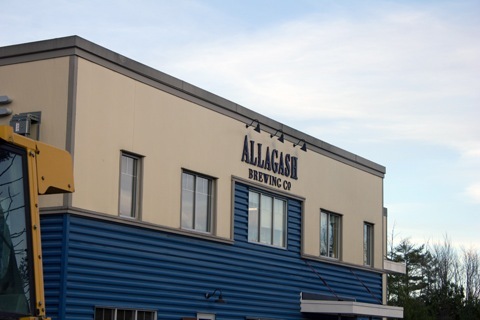 Allagash is currently building a new brewhouse (which is why they were going to be closed on Saturday), so I guess we’ll just have to go back and see it when it’s complete! 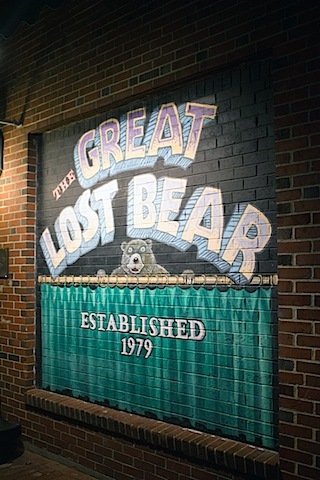 We stopped at The Great Lost Bear on our way back from Allagash since I heard it was a most excellent beer bar. It was. The nachos were pretty fabulous, too! 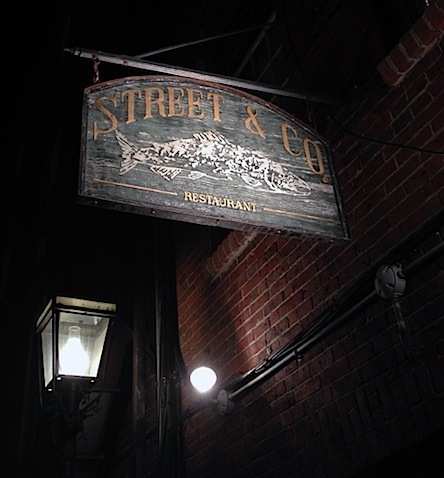 That night we hit up Street & Co., which I basically wanted to move into. 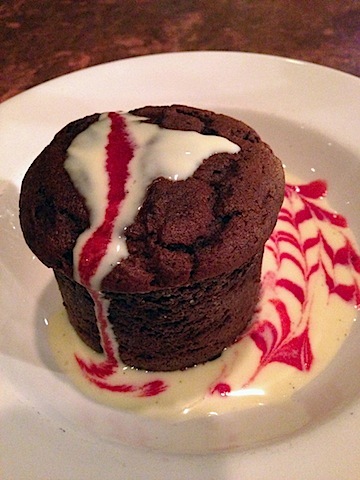 Adorable location, cozy inside, and the perfect balance of casual gourmet. 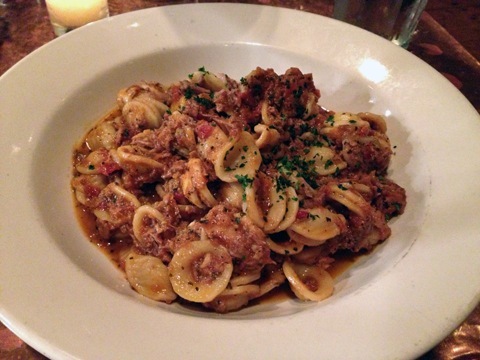 I ordered the Tuna Bolognese for dinner since it was a special and I had never heard of such a thing. It was absolutely incredible and I’ll never look at Bolognese the same way again. 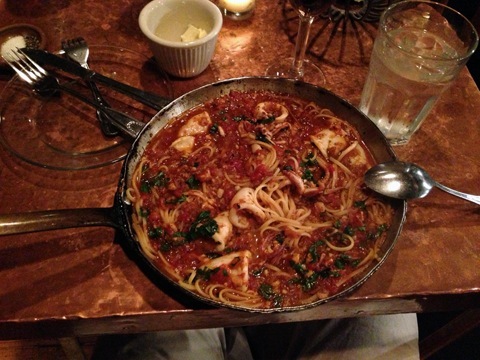 Chris got calamari in red sauce and loved that it was served in a little (well, actually kind of big) skillet. Guess I’ll need to start serving meals in skillets at home in order to impress him! Gingerbread for dessert because it sounded heavily and looked even prettier. Thank goodness it’s Thanksgiving this week because I am so in the holiday spirit! 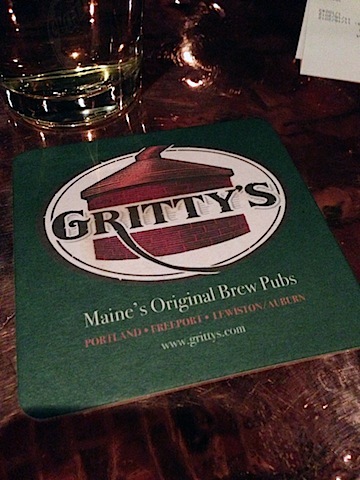 After dinner, we stopped by Gritty McDuff’s, which in Portland is a brew pub and not an actual brewery. It was hopping inside (Portland has QUITE the nightlife!) and we just ordered one drink. I opted for their hard cider since I was a little beer-ed out at this point and it totally hit the spot. We started off the next day nice and early at another of Chris’s favorite breweries. Shipyard! 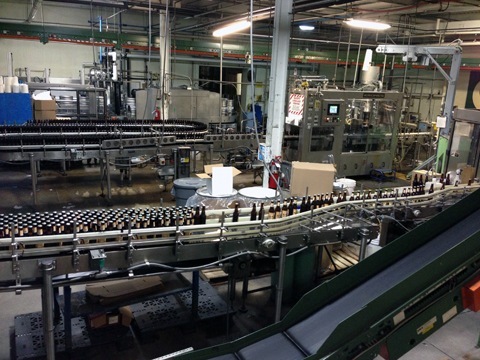 The tour was more like a movie and a peek at their bottling plant. Which, don’t get me wrong, was cool. 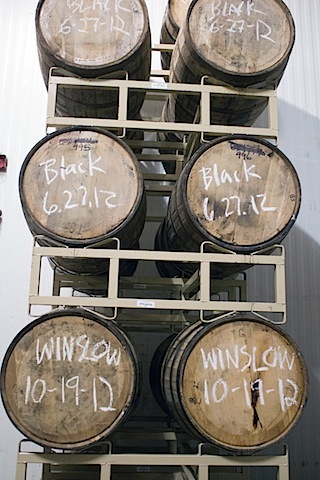 But all was even better in the tasting room. 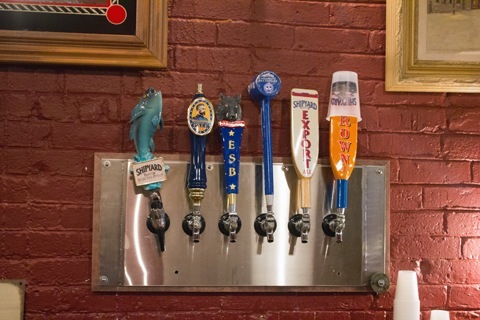 We got to try every single beer they had on tap. Including a couple of Sea Dogs. I especially loved the Blue Fin Stout, Prelude, and Old Thumper. And obviously Pumpkinhead! 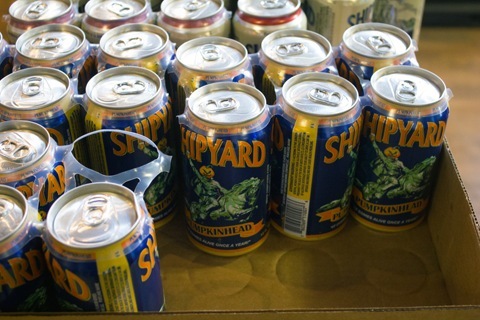 Did you know that Pumpkinhead is Shipyard’s top seller? Kind of crazy when you consider the fact that it’s a seasonal beer. But it really is that popular. We spent some time wandering around Shhipyard’s amazing retail shop, where we spotted Shipyard Pumpkinhead in a can! We’ve never seen this before and were pretty excited. 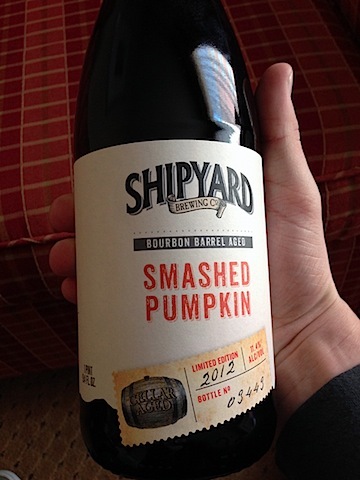 Not to mention, large bottles of Smashed Pumpkin aged in bourbon barrels. 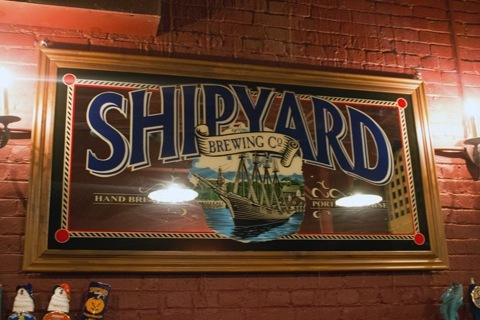 We definitely took a bit home with us from Shipyard! 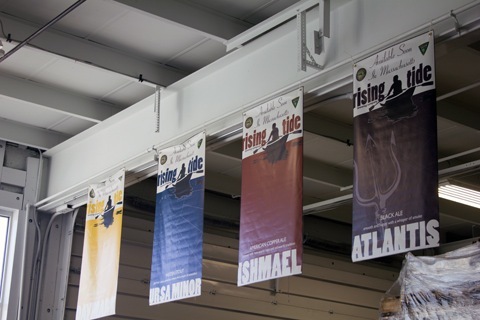 But that didn’t stop us from hitting up Rising Tide Brewery a little while later. 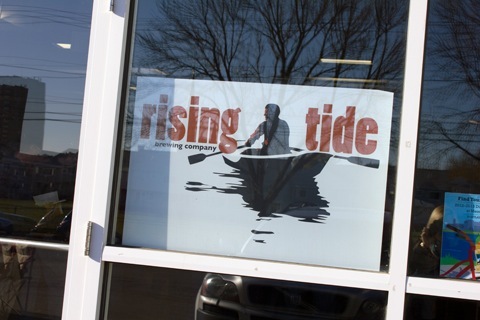 Rising Tide is a newer and smaller brewery with literally 3 people on staff. Our tour was led by the founder of the brewery. And when I say tour, I mean we stood in the room and looked at the brewing equipment. 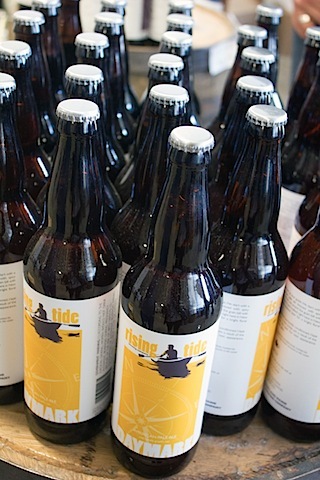 But Rising Tide was an awesome contrast to the two larger breweries we went to. 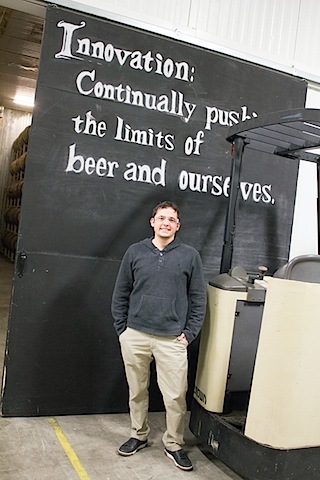 And it was great to get a peek at a brewery that’s still fairly small, but growing extremely quickly. They just started distributing to Massachusetts I think in August, so if you live in my home state, you should be seeing it around! Among many others, they brew a delicious coffee porter called The Tempest. 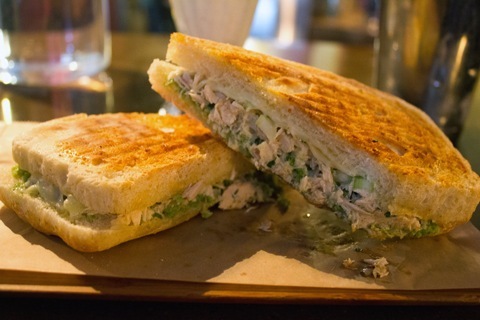 What would a trip to Portland be without a lunch at Duckfat? We loved our lunch when we went for Katie’s bachelorette and I knew I had to go back with Chris. I regretted not having enough room to order a milkshake the last time I was there, so this time it was the first thing I ordered. I got the special– Roasted Banana and Nutmeg. HEAVEN! And so perfect for a cool fall day. Chris got the Peanut Butter Banana, which was also quite delightful. This time I ordered the tuna melt with olive tapenade, which was delicious. 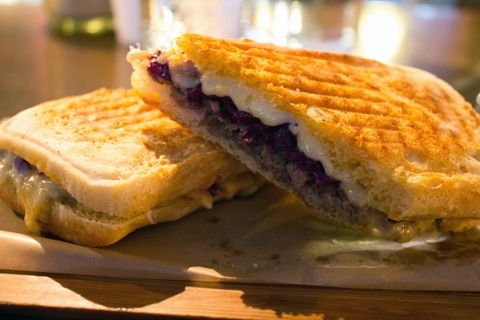 But I still think the meatloaf panini I had last time took the cake. Chris got the corned beef rueben and was basically in heaven all through lunch. 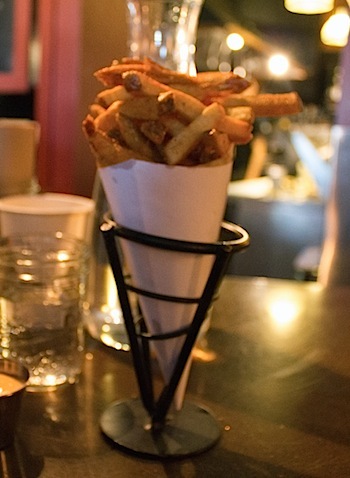 Fries are always a must at Duckfat! Although now my biggest regret is that I didn’t have enough room for the poutine. I guess I’ll have to go back a third time and make some serious decisions. Like, a milkshake, panini, AND poutine might just be a little too much if you’re planning a dinner out that evening. But I believe it’s a feat worth striving for. After lunch, we definitely needed to do some walking around (slash shopping!). 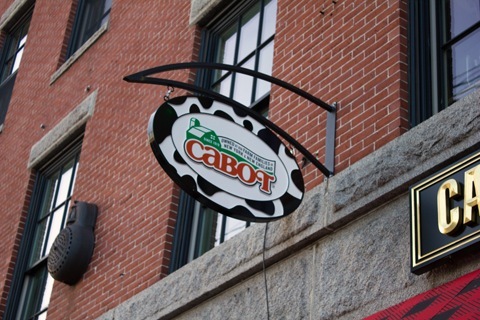 We obviously had to pay Cabot a visit! They recently opened a Farmers’ Annex in Portland and it’s an adorable little shop. Plenty of cheese samples, plus tons of gifty items and even beer and wine. 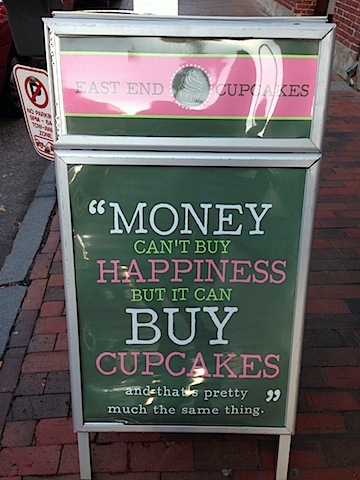 If ONLY I didn’t have that milkshake, I may have been able to make room for some East End Cupcakes. I was obsessed with their sign. ‘Cuz it’s true. (just kidding though about the milkshake; it was totally worth it!). 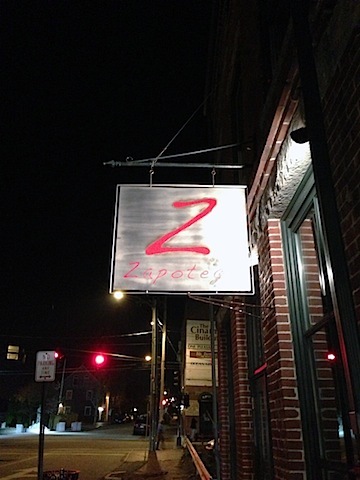 And our last dinner in Portland brought us to Zapoteca, a cute little upscale Mexican spot. 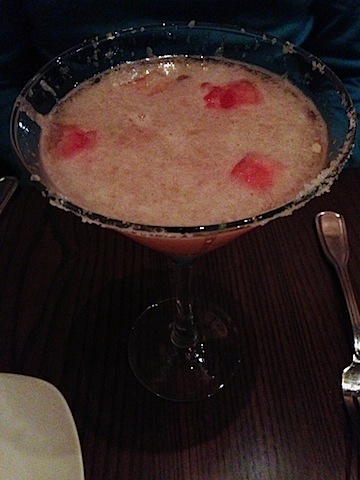 With some serious watermelon habanero margaritas (Chris’s dream come true!). 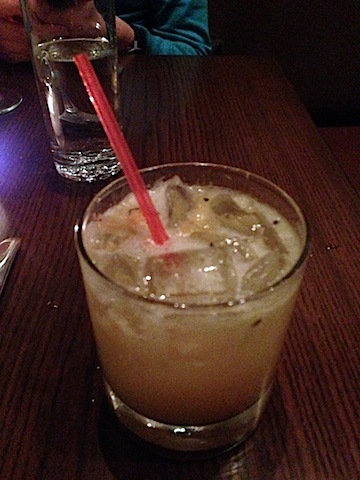 And great pineapple margarita, too. 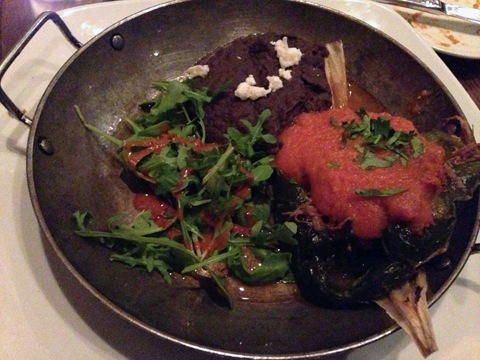 The rellenos de puerco totally hit the spot and left me with the perfect taste of Portland. Awww, so cheesy. But true! Portland is the kind of place I feel like I could go back to over and over again and never get tired of. The food scene is seriously spot on and as crazy as it sounds, I think the nightlife is even more happening than in Boston. Plus, it’s less than two hours away from Boston, making it a quick and easy trip for when you want a getaway, but don’t want to get too far away. I admit, we tend to only travel where we can stay in Starwoods resorts (because we get points! ), but seeing as there is only on Starwoods resort in the entire state of Maine, we sucked it up and stayed at the Hilton Garden Inn instead. It was in a very central location and we had a great experience staying at the Hilton. We’ll definitely be back to Portland, and hopefully soon… Maybe even on a weekday so we can check out more breweries! Happy birthday to Chris! Tagged With &rightarrow; allagash brewery •et; duckfat •et; maine •et; portland •et; rising tide brewery •et; shipyard brewery •et; street and co.
25 Responses to "Weekend in Portland, Maine: Brewery Tours and More!" This looks like such a fun trip and like a great bday with all that beer and food. I’ve never been to Portland but love Shipyard Pumpkinhead! Looks like a great way to spend a birthday! 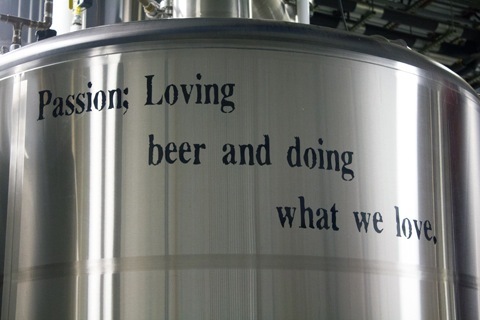 i love that the brewery was accommodating to you- that really says a lot about their quality of service! Oh I love Portland so much! I’d seriously consider moving there if it was a little closer 🙂 This sounds like my husband and my perfect weekend too! We’ve done the Allagash tour and visited some of those other places, but I think we need to re-visit some breweries post-baby haha. And I’ve stayed at that Hilton Garden Inn…loved that it was RIGHT next to Standard Baking Co.!! I had an amazing time. Thanks for everything Sues! Glad your trip was so fun! I love Portland and need to go more often! so glad you enjoyed my city! looks like you hit up some of my favorites (i heart duck fat and zapoteca). 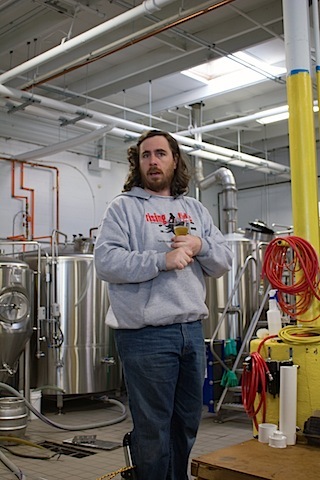 i’ve never done the tour at allagash, but i’ve met the owner a few times and he could not be a nicer guy. looks like fun! Looks like such a great trip! 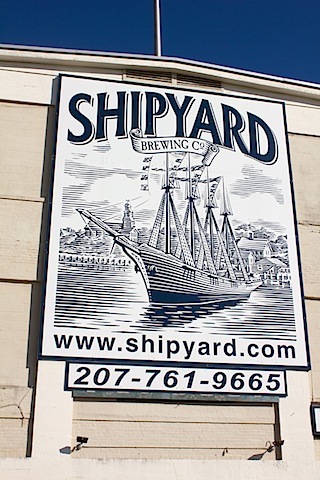 Definitely will need to do this – my husband is obsessed with Shipyard! I’ve been to Portland a couple of times and definitely want to go back. 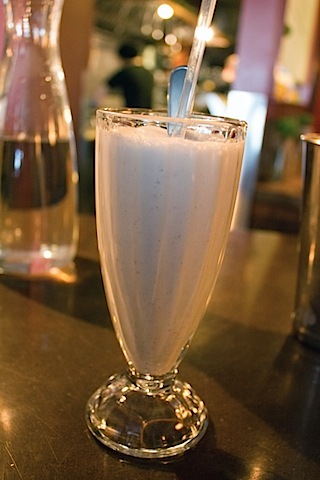 I will also plan to get the milkshake at Duckfat next time! my husband would love a birthday trip like this! I’ve always wanted to go to Portland (and Boston) 🙂 Getting too full to try everything I want is a consistent problem I have on vacation! It’s the worst, ha. The milkshake sounds worth trip #2. I ADORE Portland. One of my favorite cities, by far. Glad you guys had a great birthday weekend! I love Portland! I don’t drink beer very often, but Allagash White is one of my favorites, so I can see why that is their popular one. 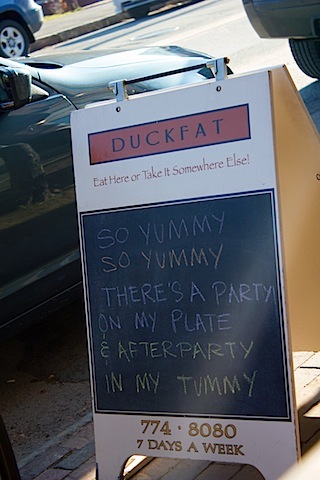 I love Duckfat… the fries are definitely a must! And I also love Fore Street and Standard Baking Co. (you have to put those on your list for next time), but I haven’t been to Street and Co. yet. 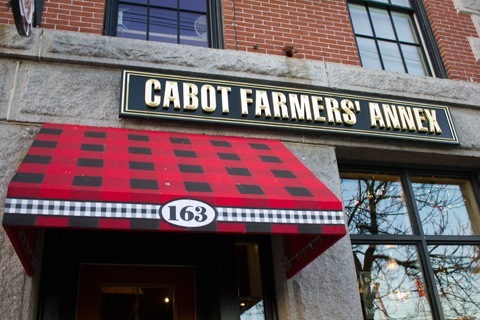 I also haven’t seen that Cabot Farmers Annex… must be pretty new. I will have to check it out next time. Vervacious is a really fun spice shop… definitely worth a stop. And have you been to Rabelais (book store devoted to cookbooks)? Thanks for coming by our brewery! I agree that “tour” might not be quite the right word, but we love to have people come in, sample the beers, and talk about what we do. Sounds like a great visit all around. Cheers! I love Portland! And Allagash is definitely a favorite beer of mine(I miss it so). Happy birthday to your husband. 30 was definitely one of my best years. No Novare Res?! For my husband’s 33rd birthday this year we got a bunch of our friends to go up to Portland for the day with us from Boston. We went to Novare Res and ordered one of everything on the cheese and meat plate. We also each got a different entree. Nom. We didn’t have room afterwards to do Duckfat justice, though. I don’t live far from Portland and have never been. Clearly I need to change that ASAP! I need Pumpkinhead in a can in my life this second. And all of that food. Mmmm!! @Beth- Yes! We actually did go to Novare Res! I made it a must-stop since I heard it was an awesome beer bar, and it was! We didn’t get any food, but just stopped in for a drink before dinner. Guess we’ll have to go back because I am a sucker for a good cheese and meat plate! I’ve been to Portland but you have made me see it in a different light…I really need to return soon! Thanks for the terrific update!! What an awesome trip – Portland is so much fun! We loved visiting Allagash too. I think it’s super cool they did a private tour for you! Going to Portland, ME this weekend and pretty sure we are going 90% of these places! Great tips! @Karen- Yay!! I hope you had so much fun! !